Look for Grosh at Biz Bash on July 19, 2017 at the California Market Center. We will be in booth 237 on the end. We have been designing and painting backdrops right here in Los Angeles for the last 87 years. We are excited to see our clients and meet some new friends. Grosh has created over 250 new backdrops and we can’t wait to see the reactions from all of our event planners. Some of our latest drops include our whimsical, colorful umbrellas which showcase vibrant colors for fun in the sun or on a rainy day. We can’t forget our Emoji drop that is filled with the cute, silly faces that we have all come to love. You have the perfect little princess who needs her enchanting castle, we have the prettiest one in the land. 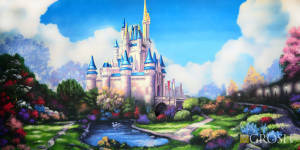 This castle is perfect for your Cinderella, Sleeping Beauty or any princess. What party isn’t fun when you have been transported to Hollywood? Everyone has dreamt of walking the red carpet and with our Hollywood Paparazzi backdrop everyone can. These are just a few of our latest drops. If you don’t see what you need give us a call and our sales consultants will be more than happy to help you find the perfect drop for your event. (877) 363-7998. We are continuing to design new drops daily. We would love to hear your ideas. Check out our latest drops on our website www.grosh.com . Look forward to seeing you at Biz Bash! !